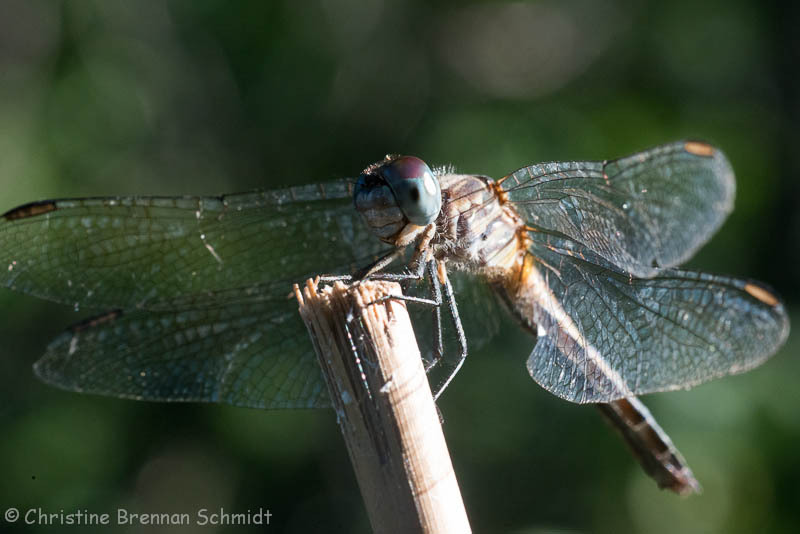 I have been seeing tons of dragonflies lately, and I've noticed that sometimes they will just sit. Such was the case last evening on my back deck. There was a dragonfly which sat on the end of a stick in a pot on the table. It sat there long enough for me to get my camera, then go find a memory card. Then it let me come up close and snap 80+ pictures of it. I was able to get really close, and was pleasantly surprised at the detail I was able to catch in spite of the fact that I was holding the camera. I usually use a tripod or monopod as this is a large lens to steady by hand and it has none of the fancy,built-in stabilization. The dragonfly would occasionally hop off, snag a bug, and land again on his perch. I knew this is what he was doing because I could get glimpse of something hanging out of his mouth as he chewed. At some point, I heard the hummingbird come up to the feeder slightly behind me. I caught a glimpse of her but couldn't really get the camera around before I spooked her. That sounds like another day's project.